How high is Adam Jones right now? We know he smokes all the time, but agreeing to eat crabs with the Goose? I wouldn’t be surprised if these two characters became friends and then Jones reports to Spring Training 30 lbs overweight after going on food binges with the Goose. Hey Jones, how about you work on some plate discipline instead of your crab eating technique and maybe your OBP will be a little higher than .318 (league average is .321) next season. But how can I blame AJ here, I would kill an infant to be in the Goose’s entourage. Cocaine, Strippers, Cheesesteaks. Look at this savage. 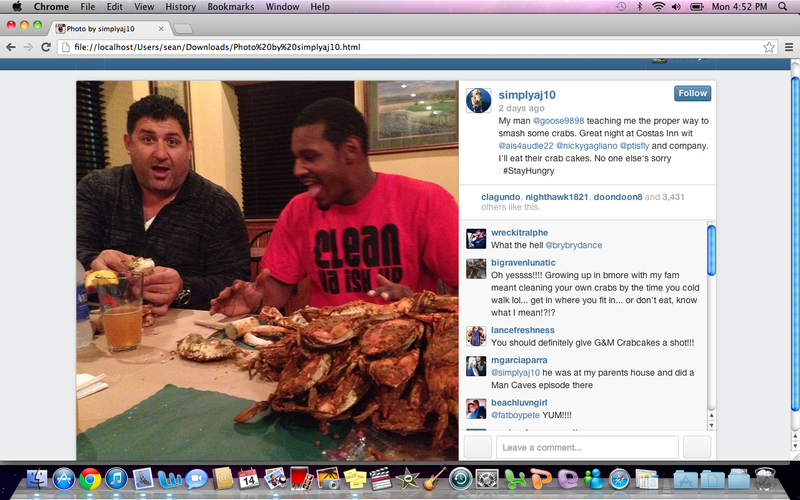 This entry was tagged Adam Jones, Baltimore, The Goose, Tony Siragusa. Bookmark the permalink. ← Baltimore’s last ‘Adult Movie Theatre’ to close this month.